A few days back we had a look at a cost-effective Z270-based Mini ITX motherboard from ECS, the Z270H4-I Durathon 2, which we found to be a viable option for typical home users but hardly so for advanced gamers and enthusiasts. 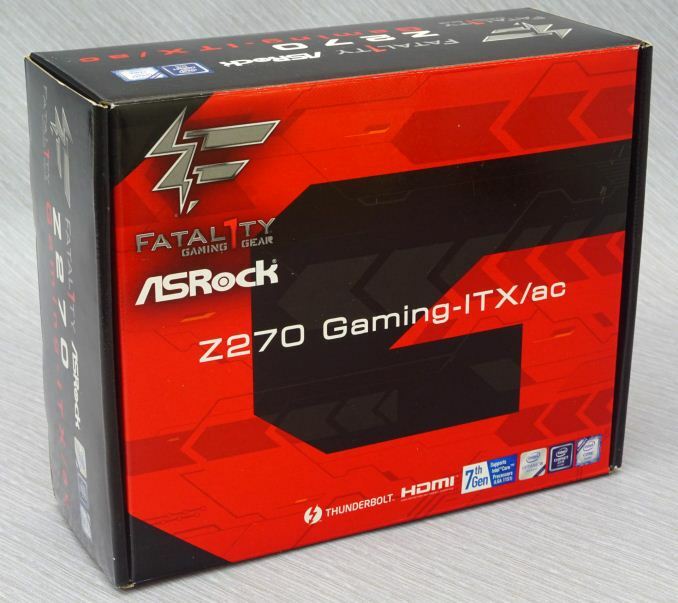 In this review we are having a look at a Mini ITX motherboard from ASRock, the Fatal1ty Z270 Gaming-ITX/ac. The concept and the design of the Z270 Gaming-ITX/ac are antithetical to those of the Z270H4-I Durathon 2, with ASRock trying to load the most and best possible features on the tiny Mini ITX motherboard, the result of which is an impressive list of features. Regardless, the retail price tag of the Z270 Gaming-ITX/ac is peculiarly reasonable for what ASRock claims it can offer. After looking at its list of features, we feel as if someone challenged ASRock’s engineers to exhibit their skills on the Z270 Gaming-ITX/ac. From Thunderbolt 3 and dual band 802.11ac WiFi to HDMI 2.0 and SATA Express connectors, the sheer number of features that the specifications of the Z270 Gaming-ITX/ac list is profound for a Mini ITX motherboard. The designers also implemented advanced power circuitry and heatsinks that we normally see on ATX motherboards targeting advanced overclockers. The audio circuitry of the Z270 Gaming-ITX/ac is interesting, with Realtek providing the advanced and popular ALC1220 CODEC. It supports the Creative Sound Blaster™ Cinema 3 and it has its front panel audio connector supported by an additional Texas Instruments NE5532 headset amplifier. Despite the small size of the ITX board, the sound circuitry is on an isolated part of the PCB. ASRock also implemented a HDMI 2.0 connector, allowing greater flexibility with high resolutions TVs and displays, as well as a versatile Thunderbolt 3 controller (Intel JHL6240). Intel supplies both the controller (I-219V) of the single Gigabit port and the WiFi/Bluetooth combo chipset (AC 7265). The WiFi controller is dual band (2.4/5 GHz) and also supports Bluetooth 4.0/3.0. There are six SATA connectors on the motherboard, two of which can be combined to a single SATA Express connector. Due to space limitations, the sole M.2 slot is on the back side of the motherboard. It supports 2260/2280 PCIe ×4 or SATA devices. Note that the use of a SATA M.2 device disables one of the SATA 6Gb/s ports. Overall, the little motherboard is trying to fulfill every desire of advanced gamers, overclockers and HTPC enthusiasts in one package. After going through the list of features, validating its performance and witnessing its overclocking capabilities, it became apparent that the designer of the Z270 Gaming-ITX/ac was trying to create a motherboard for the “ultimate” living room entertainment system, seeking to satisfy the needs of every advanced user into a single package. 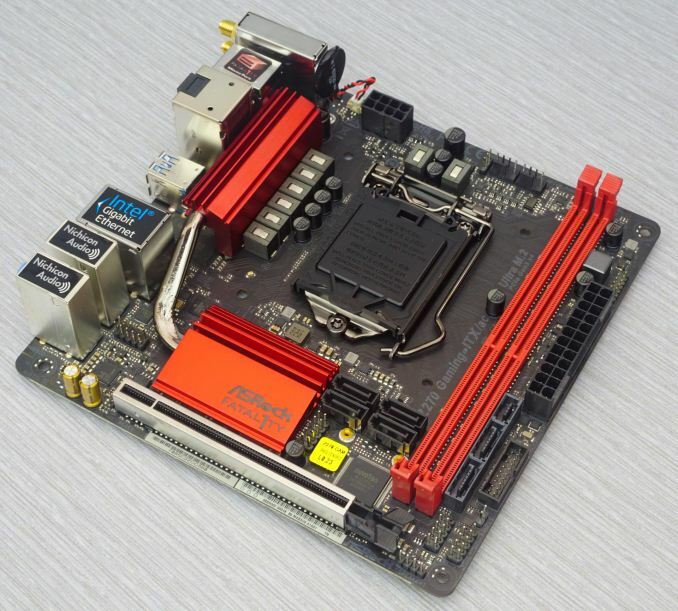 In comparison to the older Z170 boards, the new Z270 board on the base specifications are hardly any different. The Z270 ones have four extra PCIe lanes configurable on the chipset, potentially new audio and new networking controllers, and Intel Optane Technology Support. Although four extra PCIe lanes do sound like a huge difference, it is an important upgrade for the implementation of native M.2 slots (on Z170-based motherboards, this usually meant disabling some other device/port on the motherboard). Also, note that Intel Optane drives should still function on other chipsets as drives; the Z270 only allows them to enable their “smart caching” technology. Individual motherboard manufacturers will be sprinkling on new features onto their Z270 products to aid the transition and provide other tangible benefits over the old platform. To read specifically about the Z170 chip/platform and the specifications therein, our deep dive into what it is can be found at this link. One thing that we should note is that the advent of the Z270 chipset brought a change on the naming of the USB ports. What we knew as USB 3.0 ports are now being dubbed as “USB 3.1 Gen 1” and the 10 Gbps ports are now called “USB 3.1 Gen 2”. We first encountered this change while reviewing the MSI Z270 SLI Plus a few months ago but it seems that most of the manufacturers are following suit, rewriting their websites and reprinting their manuals. Users need to be extra careful when very high bandwidth connectors are essential. "You should buy some and send them to AT." How about buying Asrock one of its 170 boards so it can fix the BIOS for it with the code Intel gave them in April. Interesting attitude and misleading statement. You had 4 mobo reviews after the Ryzen launch , staff or no staff and it's statistically significant that none is for a Ryzen mobo. If you add context like interest in the product, value offered, it becomes more than odd. What's the cause, that's for you to figure out and adjust but that seems unlikely given your attitude. - "or perhaps you'd want me to forgo the CPU tests?)" All by a single reviewer - who also does all the case, PSU, and keyboard reviews too and thus has limited free time available - and on a single platform. The latter is because as a distributed team Anandtech doesn't have a single office to store all their stuff. Each reviewer needs his/her own set of parts to test with; and for consistency the same parts (particularly the CPU for OCing) need to be the same for everything done on the platform. To avoid spending large amounts on shipping and customs fees that means any part time mobo reviewers are probably only going to have a single platform. E. Fylladitakis is doing Z270. One or more of the newbies is working on Ryzen.